I’m so excited to be part of this Blog Hop and share this project (and awesome giveaway) with you! 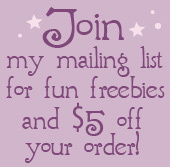 At the bottom of this post you'll find our Blog Hop schedule and giveaway details. 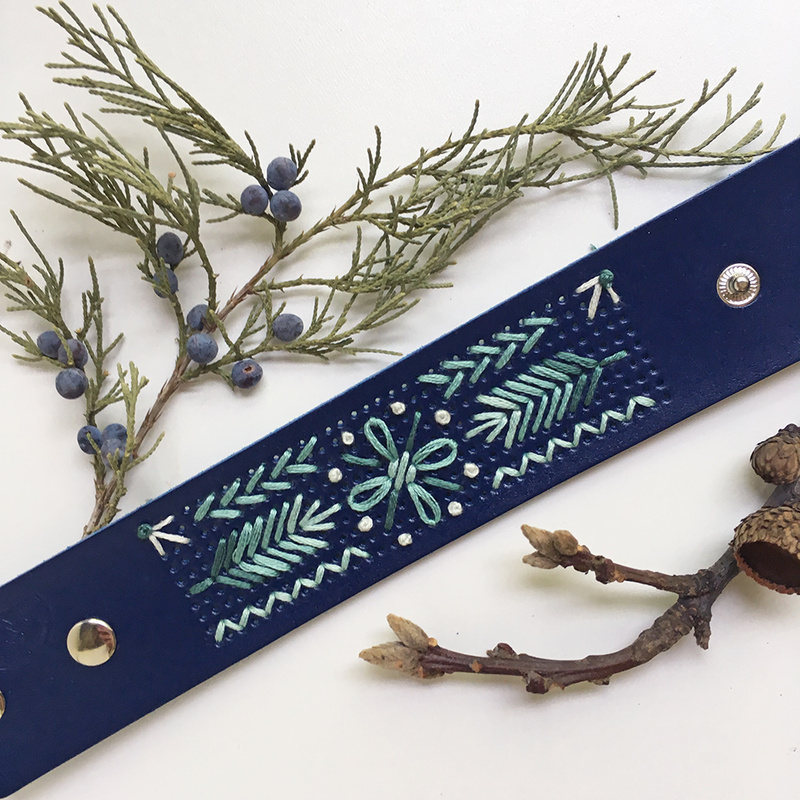 DMC has introduced these new stitchable faux leather wrist cuffs and they are so much fun to work with. They come in four colors and are punched with holes and ready to stitch up with the design included, or one of your own! 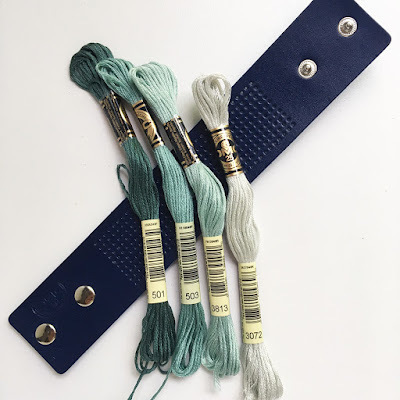 Although the dot grid is designed for Straight or Cross stitches, you can easily use some of your favorite hand embroidery stitches as well. I’ve used French Knots and Lazy Daisies in addition to Straight stitches for this design and I love how it turned out. 501, 503, 3813 and 3072. 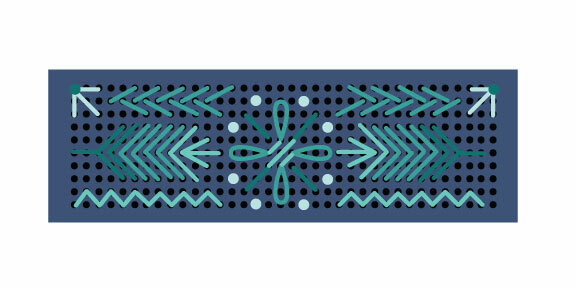 You can stitch up this design by counting the holes and following the Flowers and Feathers pattern below. 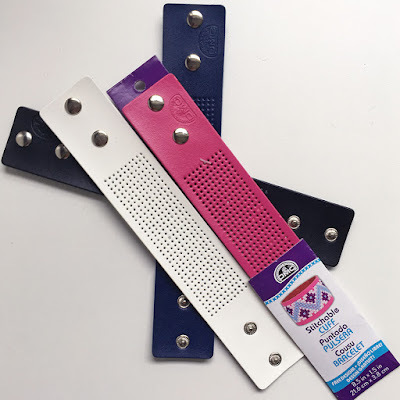 The 360 pre-made holes on the cuff are are arranged in a 36 x 10 dot rectangle. To begin, count over 18 holes from the left and 5 holes down. This is where you’ll make your first stitch. 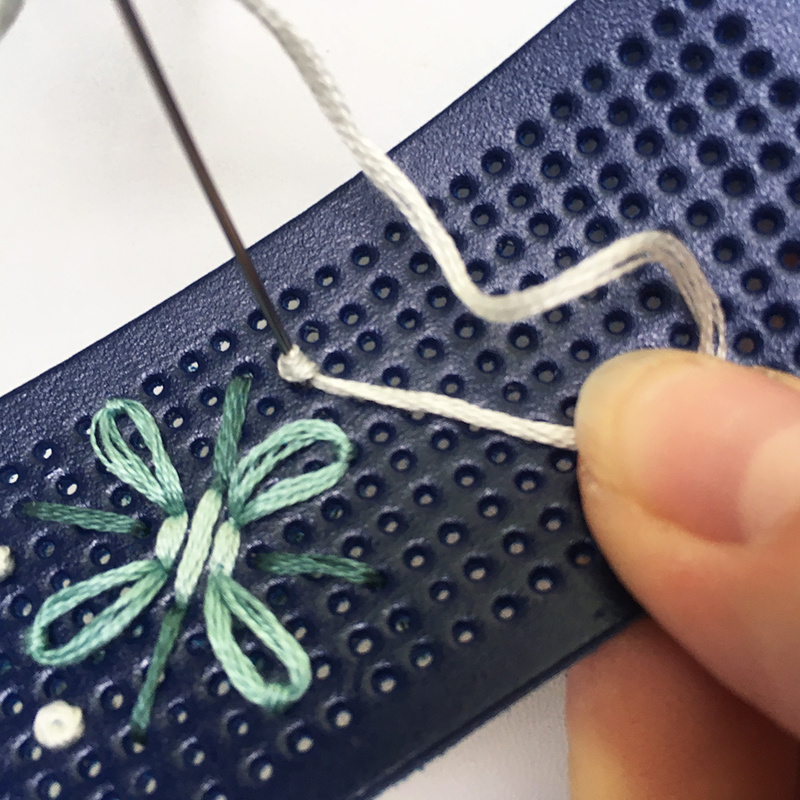 I embroidered this cuff exactly how I would embroider on fabric and had no problems at all. 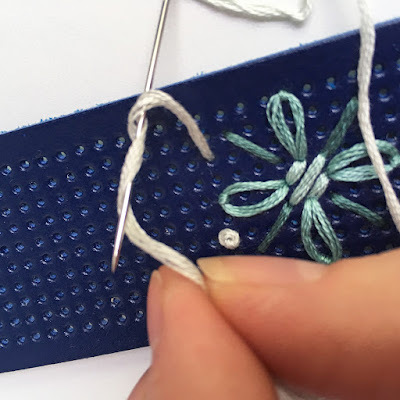 Use all 6 threads of floss and tie a knot in the end, then pull it through at the correct hole and begin stitching diagonal Straight stitches to form the center of the flower shape. Switch colors and add the lines at the four corners. For Lazy Daisies, make a loop across two holes. 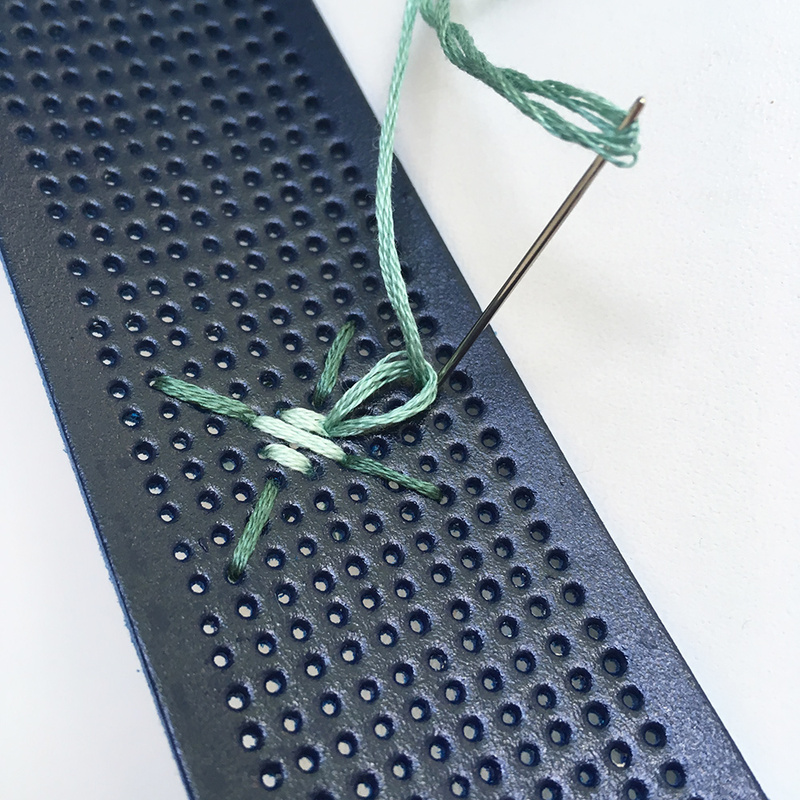 At the third hole, make a tiny stitch to secure the loop in place. This stitch will come up from and go back down into the same hole. Pull it just tightly enough to keep it in place, but not so hard that it pulls the end of the loop through the hole. For French Knots, begin by wrapping the floss around the needle as shown. Reinsert the needle into the same hole, pulling the floss taut as you push the needle back through. 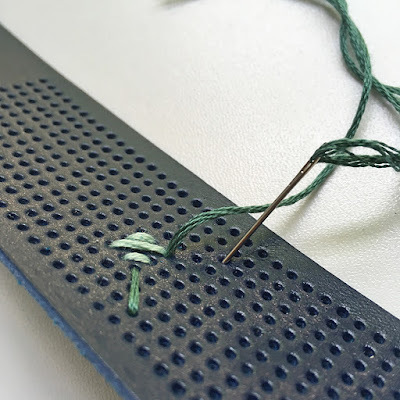 Count holes out from these center stitches to continue the design with Straight stitches. For the top feather shapes, turn the cuff vertically. Count three holes up (towards the center) and one hole over for each diagonal stitch, then begin the next stitch in the center of the previous one. Finish up the pattern with French Knots and Straight stitches at the top corners. All done! Stitching these cuffs is easy and fun, and you can complete one in an hour or two. Check out this video for more cute wrist cuff ideas. I hope you’ve enjoyed this tutorial and that you’ll give these cuffs a try. My latest is bibs for a new grand baby. Fast and fun. I love these cuffs!! This is so darling Aimee!! That pattern is so darling - I love the ombre coloring in the stitches. This is totally my weekend project! What a cute cuff! I love your design. My current embroidery project is a crazy looing mermaid from a 17th century drawing of ocean fish and creatures. I want to do a series of the wonderful imaginative creatures people believed in. My daughter loves stitching. She recently made a piece for our county 4-H fair by stitching a rainbow flower on paper. 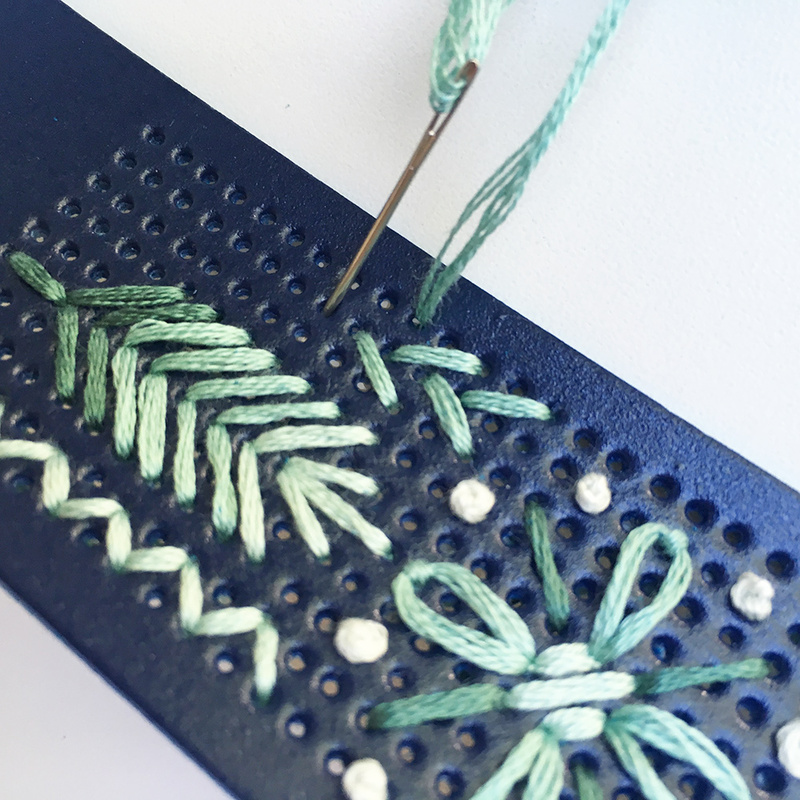 These embroidery bracelets are such a cool idea!! I am just starting to make a skirt for my little one with an embroidered seahorse blouse. I have only embroidered on fabric things but this is amazing! I love cuffs and this one is beautiful. Cute bracelet. I am stitching a wall hanging The Lords Prayer. These are so cool looking! I'm currently on a cross-stitch roll, despite usually doing hand embroidery. I'm working on Satsuma Street's Pretty Little London design after finishing her Wizard of Oz piece a month or so ago. This is so cool! I'm working on a floral stained glass embroidery pattern my friend designed, right now. I've just started embroidering again after many years so I'm just practicing different stitches. I know my granddaughters would love these cuffs and they are so forgiving , they love anything MomMom makes so I think I'll order some! I am making some embroidery pillowcases as Christmas gifts. How fun! I actually just created some cards where I accented the stamped images with stitching, my girls would love these cuffs! These new cuffs are just adorable!! I'm about to make a dresser scarf and finish some Christmas ornaments. Right now I am working on a large-ish scale cross stitch of nautical signal flags. 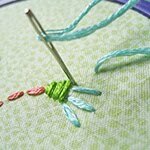 I am embroidering a wall hanging for my sewing room. I am working on some floral blocks to make a summer wall hanging. Love those cuffs. These cuffs are such a neat idea, they would be great for easy DIY gifts! I'm working on an outline of my soon-to-be-arriving sons name, all in french knots. It's relaxing, but it might be a while before it's done! I'm working on a sampler for my newest granddaughter! I love embroidery! These cuffs are so original! I have been stitching a project for my best friend whose mom has Alzheimer's. It's a primitive design with a sweet quote about friendship. I'm hoping to make it into a small pillow for her home. Your cuff is lovely! Love it! This will be new for me. I have stitched on paper. It is time to start a new project. I did want to make a pendant, but now I want to make a cuff! Wanted to add that your pictures are great. 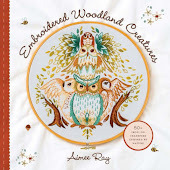 I'm new to embroidery & the pictures are a big help. I like that pink cuff! I'm not working on anything right now but, I have a lot of projects in mind and would love to win. My daughter would love a cuff like this!!! I would make her a pink one!! I have been trying to find a little mermaid to embroider on a few things for my 3.5 year old. She is mermaid obsessed! I am working on an embroidery sampler, full of little mixed media elements. I just love those stitchable cuffs. So adorable. At the moment trying my hand a some free-form embroidery on baby bonnets and treasure pouches! I love cuff bracelets and yours is gorgeous!! Thanks for the chance. I'm working on a personalized hoop for my friend's wedding gift. I am working on a set of pillowcases for my mom. I just finished a challah cover for my family, so I'm a bit between projects. I'm using up some odds and ends on a little sampler (an actual experimental one) while I figure out what's next. I really want to play around with feather stitch and find a variation I like. I'm working on some embroidered Christmas ornaments. I procrastinate so it's time to start getting ready for the Holidays! This is a fun design. WOW the stitchable cuff is super cool. My latest stitching project was cross-stitched wood necklace pendants. I god the kits from Hobby Lobby and totally enjoyed the time making them. Thank you. I want to make something from all three! An outline of mine and my Husbands hands. I'm working on my first embroidery project - it is a small landscape image with a memory verse on it. I LOVE this cuff with the stitches! I'm definitely picking one up on my next trip to the craft store! I'm working on littledear's gnome house during my vacation at the ocean this week. Hoping to surprise my niece with it when we get home. Last year I made several of the forest critters on vacation and turned them into a baby mobile for my cousin's first child. I always get all the felt pieces cut out to take, and all the floss on cards, so I only need my phone for the pattern. Really looking forward to making the cuff pattern for my daughter. Thank you! Lately I've been working on a Stitch a long and I just took a class last night stitching on Felt that was really fun! 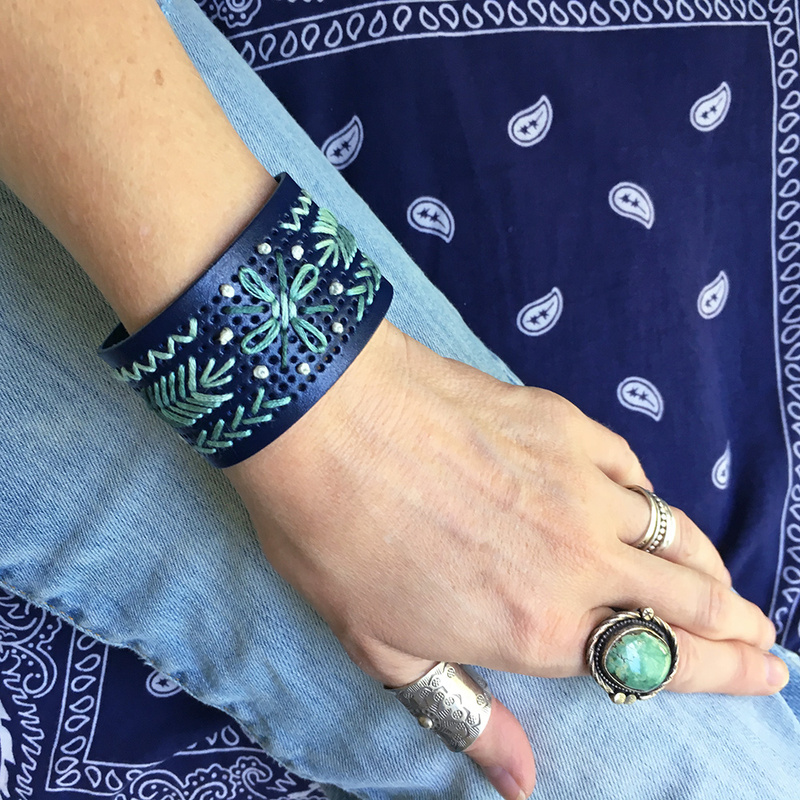 This cuff looks wonderful and I'd love to give it a try! Beautiful cuff! I've been stitching felt masks lately. I've got a gazillion projects going on, but the two I've worked on most recently are the 1 Year of Stitches project and a small crazy quilt. I'm about to start a horse embroidery on a pillowcase for my oldest granddaughter. I'm working on a stitch sampler in super bright colors. Love your dolls! Love the cuffs. Current project for me is a Bucilla felt embroidered Advent Calendar. Almost done! Will be ready for Christmas! YAY! I love your bracelet design! The project I'm enjoying most right now is a year long quit motif sampler I started on my birthday - I'm doing one little triangle a day using scraps of floss. Beautiful bracelet! I am working on the finishing portion of an advent calendar I have cross stitched. I love the ombre stems! My most recent project, which I haven't actually started the stitching on, is to make a redwork version of my in-law's house. I'm using blue thread that matches the color of their house. I hope to get it done in time for Christmas for them. This chain of posts has given me so many more gift ideas. I cannot wait to get working! I love this! Adding it to my to do list. I am currently working on stitching up a mandala! I am currently stitching a Christmas redwork panel with multiple frames. Only I'm not just using red. Decided to make it colorful. It's my busy work while I visit my mom who has been ill. So beautiful, I like the designs you shared with us. This is so beautiful. 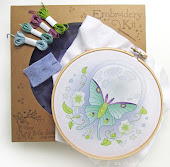 Keep sharing these type embroidery designs with us. Hi, Aimee! I am not currently working on a project because we are in the middle of a military move and they packed everything! Oops! I still hope you'll consider me for your give away though! Thanks for being you! I'm currently cutting out pattern pieces to make my toddler a felt nativity for Christmas! Next step is tracing all of it onto the felt pieces and cutting those out! I think I spend the most time a) choosing which beautiful felts to use and b) cutting everything out. Stitching is such a breeze, comparitively, on the felt!